The Chicago Sun-Times reports that, "A veteran Cook County Circuit Court employee was ordered held in lieu of $750,000 bail Saturday for allegedly taking court files from work and then shredding them at her kitchen table." Rumman Hussain writes that Jeannette Neibauer was arrested at the Daley Center last Friday. At the time of her arrest, Neibaurer was assigned to a courtroom in the Law Division (and, no, the paper did not specify which room). Hussain's article also does not specify what records were allegedly shredded. Were whole files really removed from the courthouse? Or (and this seems more likely if my understanding of work flow patterns is not too long out of date) does this loss involve the removal of documents that were to be coded for the Clerk's computer docket system before physical filing? Every Cook County attorney who's handled a civil appeal recently has a story or ten about documents missing when it came time to assemble the Record on Appeal. The allegations against Ms. Neibaurer, if true, may solve some of those mysteries. Bye, Abdon . . .
Gov. Pat Quinn snagged the Chicago Sun-Times’ award-winning political reporter Abdon Pallasch to be Illinois’ assistant budget director. ◆ Let’s hope his 25 years dissecting federal, state, county and city budgets for the Chicago Sun Times and other publications will help him sort out the state’s financial mess. Pallasch, an alumnus of the Chicago Daily Law Bulletin, was one of the few reporters on either of Chicago's major newspapers to provide serious coverage of Cook County judicial elections. His articles on Cook County Democratic Party judicial slatemaking sessions will be particularly missed. 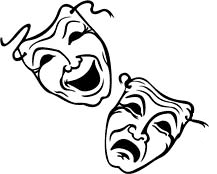 Email received this morning from Christine Athanasoulis advises that the Illinois Judges Foundation is sponsoring a Comedy Night this coming Tuesday, July 24, at The Second City e.t.c. Stage, 230 W. North Avenue (2nd floor). Tickets for the event are $100 each. The price includes admission to a pre-show reception (with open bar) and a ticket to the show (at which there's a cash bar). To register for the event, simply click this link. For more information about the event, or for sponsorship opportunities, contact Kathy Hosty at khosty@chicagobar.org. The Illinois Judges Foundation was founded in 2007 and is the charitable arm of the Illinois Judges Association. The IJF funds educational, civic, and scholarship projects that benefit youth and law students, and encourages judicial participation in these endeavors, to advance the rule of law, the legal profession, and the administration of justice. Can law schools be used for the actual training of new lawyers? The cover story in this month's ABA Journal, by Indiana University Law Professor William D. Henderson and Rachel M. Zahorsky, "The Pedigree Problem: Are Law School Ties Choking the Profession?," raises (inadvertently, I suspect) a real question about the basic use or purpose of a law school education. The most successful of corporate law firms adapted to this business climate by hiring promising law school graduates and embedding them into their own training system, which over several years supplied inductees with a well-rounded and complete skill set that could be deployed for the benefit of clients. One key operational question of this training model was entry-level hiring. Cravath and his contemporaries favored graduates of a handful of Ivy League schools — namely Harvard, Columbia and Yale — and so-called national law schools, including the universities of Virginia and Michigan, for the coveted training positions. A young man or woman graduates from any medical school and is thrown into the overnight shift in the a busy ER, treating traumas and heart attacks and chronic diseases right from the start. But a young man or woman, even one from the law schools at Harvard or Yale, goes to a silk-stocking firm and disappears into the library for a few years, looking up cases, reviewing documents, eventually getting the opportunity to carry a senior associate's briefcase to court for a status hearing (the senior associate's hands are full carrying the junior partner's briefcase; the junior partner is encumbered with the senior partner's papers). Despite the superior 'legal education,' the firm's lawyers had to be 'built' from the ground up. Henderson and Zahorsky cite a number of reasons why the white-shoes firms took (and still take) only Ivy League graduates (or graduates of a few others, depending on the city where the firm is located): "They required extensive undergraduate education, their courses of study were full time and taught by scholarly faculty, and they tended to admit students well-connected to the commercial world." 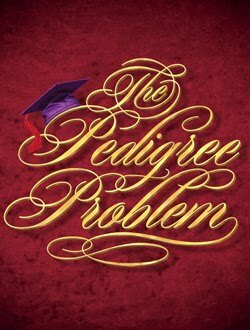 Henderson and Zahorsky write about how law schools around the country aped the Ivy League casebook method, apparently believing -- and certainly asserting -- that there was something in the curriculum that gave the Ivy League graduates greater opportunities. Henderson and Zahorsky are on familiar ground here; this is an oft-told tale. But could these long-ago law school advocates really have been that naive? Since its inception in 1986, a handful of teams has dominated the league tables, including Stetson (five-time winner), Northwestern (four-time winner), Chicago-Kent (three-time) and Temple (three-time). The trial teams are judged blind; law school affiliations are not revealed until the end of the tournament. The appearance of top-tiered Northwestern Law with tier-two Temple and Chicago-Kent and tier-three Stetson suggests incoming credentials do not preordain performance as a lawyer. And the repeat appearance of a handful of schools suggests expert coaching and practice — a form of legal education — may be the real linchpin of excellent courtroom advocacy. But it was only by clerking that most students could hope to find jobs. One or two might get a sniff from a local big firm, a few more would get state court clerking jobs -- but what about the rest of us? In the ER, no one cares where your medical degree is from. The new doctors from Harvard or Acme Night School must all perform to the same standard of care -- and right from the start, too. Professor Henderson and Ms. Zahorsky cite a lot of psychological jargon in their article, but it's all beside the point. Until law schools produce graduates who can appear in court or document or close complex transactions right from day one, they are irrelevant obstacles that must be overcome before a hopeful young lawyer can begin to learn his or her chosen trade. 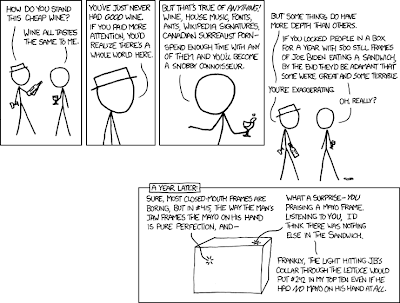 Distinctions among law schools: Real or random? 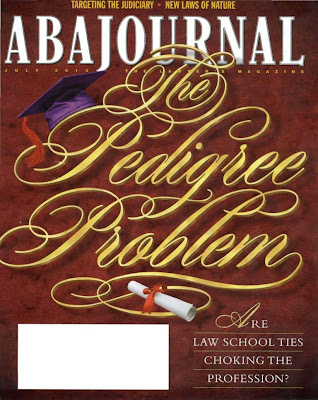 You can read the cover story in this month's ABA Journal, by Indiana University Law Professor William D. Henderson and Rachel M. Zahorsky, "The Pedigree Problem: Are Law School Ties Choking the Profession?," and decide for yourself. 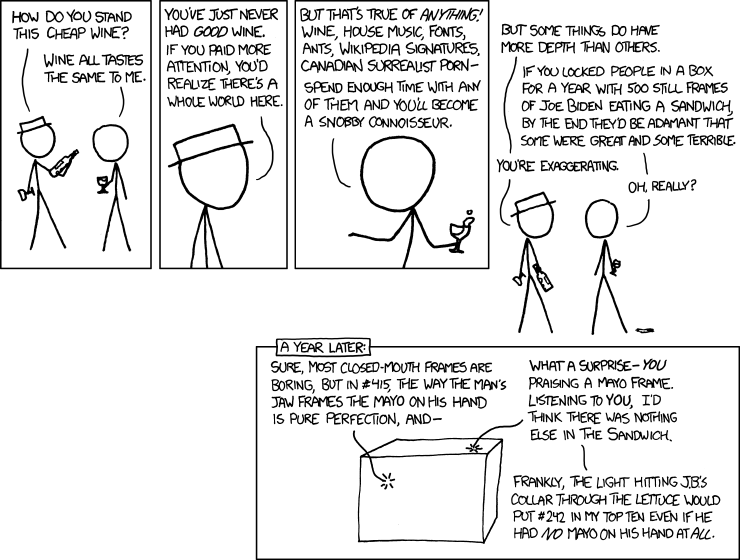 For my part, however, that aspect of the article called to mind this cartoon I'd seen on xkcd some time ago. The ABA Journal article also addresses ways in which law schools are trying to reinvent themselves, update their curricula, and make themselves more relevant in the modern age -- all of which raises an (I think) unintended question of just how useful or relevant law school ever was to the actual practice of law. My June 15 post, Congratulations 2012 law school graduates: What were you thinking, generated a fair amount of traffic, as did the follow-up,Update on last Friday's post on the parlous prospects for new law grads. The posts also generated a thoughtful letter from a 2011 law graduate. I've communicated with this individual since. One of the main questions you seem to ponder is: "Why do we do this to ourselves?" You talk about how courts have dismissed lawsuits by basically saying: "if you were smart enough to get into law school, you should have been smart enough to see through the rosy employment and salary figures put out by all the law schools." I understood the numbers were "rosy," but it was hard to really understand how badly they were off at the time. It's like the old quote: "There are lies, damned lies, and statistics." The numbers are just so far out of tune with reality that no one knew how bad it was. Eventually you just assume there is some accountability there. That law schools wouldn't and couldn't fudge the numbers that badly. We were wrong. The University of Illinois, a school I considered, was making numbers up! Everyone assumed the economy would be better by the time we graduated law school. When you are in your twenties, three years is a long time. You assume things will be different when it's your turn to be actively job hunting. For that we have no one to blame but ourselves. We just really wanted to be attorneys. Most of us still do. As for the job market itself, it's as miserable as advertised. It's been seven months since I was admitted to the bar and I have had two interviews. Short of those interviews, I have had no success greater than a courtesy email informing me that my application was received. I have spent most of my time either covering appearances for other attorneys or working on document review projects for an hourly wage. Nine out of 10 times an alum won't return a phone call or email. When they do, normally their advice is to go get an MBA. My story is a dime a dozen among my classmates and peers. In fact, it's much better than most, as you generally can't get document review jobs anymore without prior document review experience! If a respectable firm offered me $10,000 for a position, I would leap at it. Right now experience is worth its weight in gold. There are jobs for attorneys being advertised, but very very few entry level positions. The problem is, what's the alternative? Most attorneys have English or Poli-Sci backgrounds. What kind of job will you get with that? I have a Business and Finance double major and I have yet to even get a response from a company based on that. It's easy to think that we should just move on, but many of us just can't. If recent news accounts can be believed, this young man's experience is all too common. Roughly half of the members of the 2011 graduating class of Loyola and IIT-Kent are apparently in this same situation; six out of 10 DePaul's 2011 graduates are still looking for full-time legal work. Twelve per cent of the University of Chicago's graduates can't find work, for cryin' out loud. Yes, the unemployment situation for newly minted lawyers is clearly exacerbated by the many continuing problems with the economy as a whole -- but the theory has always been that the more education one has, the less likely one is to become a victim of the economy. Clearly, the experience of recent law school graduates has been quite different; that suggests that something is fundamentally wrong with our legal education system, doesn't it? at thirty the wit; at forty the judgement." At one point, all human cultures accepted a correlation between age and wisdom. In Republican Rome, for example, the first to speak in any Senate debate was the princeps senatus, the most senior senator, drawn from the ranks of the patrician consulares; only after he spoke could the rest of the consulares, that is, those who had held been elected consul (and no one could be elected counsel before 'his own year' -- 42 for plebeians, 40 for patricians) provide their opinions. Then, in America, came the Baby Boomers -- and they proclaimed that no one over 30 could be trusted. That was, of course, before the Baby Boomers began turning 30. Now the Boomer generation orbits somewhere around 60 -- and, not surprisingly, science has been deputized to discover why gray hair should now be considered a good thing. An article by Helen Fields on Smithsonian.com, "What is So Good About Growing Old," says that researchers are discovering that there are real advantages to aging. "In a University of Illinois study," for example, Fields writes, "older air traffic controllers excelled at their cognitively taxing jobs, despite some losses in short-term memory and visual spatial processing. How so? They were expert at navigating, juggling multiple aircraft simultaneously and avoiding collisions." For a 2010 study, researchers at the University of Michigan presented “Dear Abby” letters to 200 people and asked what advice they would give. Subjects in their 60s were better than younger ones at imagining different points of view, thinking of multiple resolutions and suggesting compromises. The current research on aging provides a scientific explanation for the increasing importance of mediation in resolving civil disputes. The trial of a lawsuit is a win or lose, 1 or 0, hit or miss proposition. Mediation, however, under the direction of one sufficiently trained and experienced, can provide the compromises or "multiple resolutions" that can send all parties to a dispute home satisfied (if not exactly happy). Judicial service is not an essential prerequisite of the successful mediator. Judicial service is merely one kind of experience that a good mediator can draw upon in helping to facilitate the resolution of civil disputes. In a lot of cases, judicial service may be very relevant experience on which to draw and, thus, many ex-judges have become quite successful mediators. But it is the wealth and variety of experience, judicial or otherwise, that the mediator brings to the process that enhances the prospects for success: It is the mediator's age, and the wisdom that experience has provided, that is important, not whether there is an old robe hanging in the mediator's closet.